A must read for Healthcare Leaders. 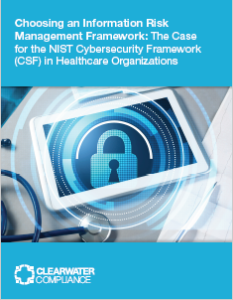 The white paper describes the role a cybersecurity framework plays in a healthcare organization’s overall risk management program, and why the framework is an appropriate and effective framework for the healthcare industry. Don’t miss Breakfast & Breaches™, a special LIVE Expert Panel Discussion, in town hall format, coming to a city near you. Join onsite or join us via LIVE webcast! Breakfast & Breaches™ is brought to you by Clearwater and Lockton Companies Partner, Maggie Spalding. Founder and Chairman of Clearwater - Bob Chaput, and Lockton Companies Partner, Maggie Spalding discuss the vision and the success Clearwater's Breakfast & Breaches™. Wandah Hardy and Joe Rungren of the Office for Civil Rights discuss the importance of understanding the rules, performing a risk analysis, and dealing transparently with OCR.